Helsingin yliopiston ainejärjestöläiset, HYAL, is an organisation operating in the representative council of the Student Union of University of Helsinki (HYY). HYAL is uncommitted to national party politics. HYAL sees that HYY reaches its members best through the different organisations operating within the Student Union. HYAL wants to ensure that these organisations have all the best resources for student advocacy work, organizing events and taking care of their members. HYAL also takes stand on issues regarding students position in national social and educational policy. The goal of our advocacy work is to secure the best possible conditions for studying for every student. 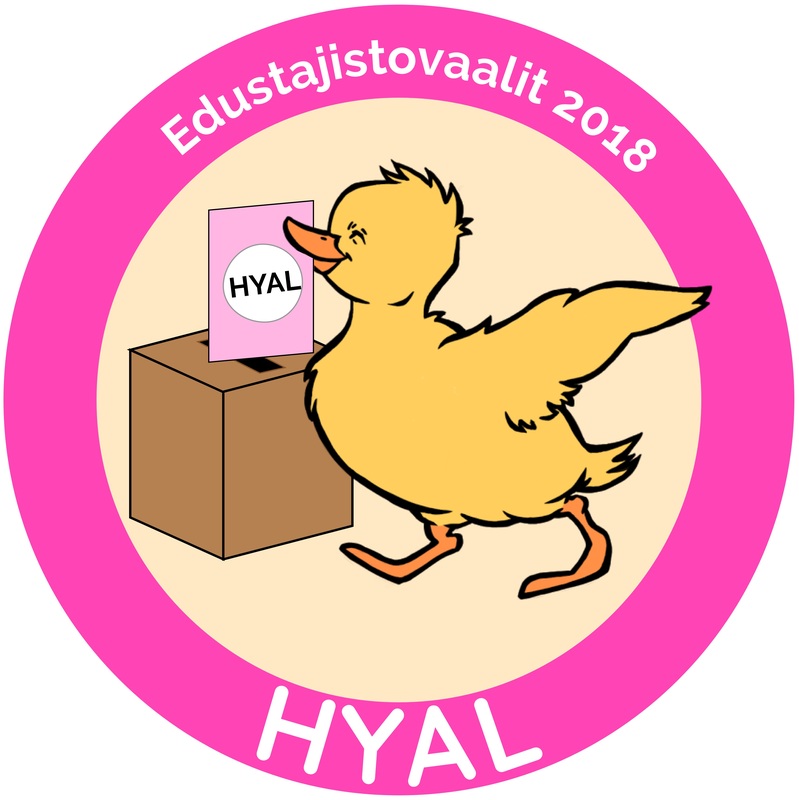 For HYAL being uncommitted to party politics means we won’t take a stand on issues that don’t affect the everyday life of students or the Student Union. The core values of HYAL are openness, diversity and sense of community. HYAL is commited to acting and making all decisions based on these values. HYY must regularly offer trainings for the volunteers working for its organisations. These trainings should cover both common topics and current issues within HYY. HYY must offer the kind of services and counseling that the organisations need. Special emphasis should be placed on helping out new organisations. All information and communication related to the services and trainings HYY offers must be accessible and up to date. Diverse and functional premises is vital for organisations. Organisations need premises for meetings, parties and other activities. The utilization rate of current organisational premises is extremely high, therefore HYY must find out the look into the possibility of finding a new multi-faculty multipurpose hall for the use of its organisations. Every organisation is dependent on its volunteers. Ensuring that volunteering in organisations is both significant and rewarding is the best way to guarantee the sufficiency of volunteers. HYY encourages its organisation to develop their activities bravely, positively and with an open mind towards a stronger sense of community. HYY also trains volunteers on how to identify the skills they have gained from volunteering and how to verbalize them. All the skills acquired from volunteering for organisations, such as organising, leadership skills and analytical thinking, should be seen relevant for working life. HYY’s goal must be that acquiring these kinds of skills would count as study credits. HYY produces certificates and diplomas for volunteers in organisations and works to ensure their established use of them. HYY must secure that every student receives individual support and services, that suits their life situation, from the university, student union and the society. HYY must produce services and action on all campuses as equally as possible. Especially students with families should be taken into account when HYY is planning new services and events. The child care service Little HYY should be made to part of the flexible daycare services of the city of Helsinki. Education is both society’s and individual’s investment on future. Studying should be seen as a valuable phase in a person’s life, not just as a waypoint on a road to working life. This should be recognized on all levels of political decision-making. Financial aid for students should not be age-restricted and the level of study grant should not be cutted. The household-based nature of general housing allowance must be abandoned and the allowance be made personal. The university must offer versatile study methods. Online examinations doesn’t substitute high-quality teaching but compulsory attendance doesn’t suit the needs of every course. Teaching methods for every course should be justifiable and flexible. It’s important that studying doesn’t burden for example students with families. HYY must make sure that the teaching staff of the university is well informed on issues regarding equality, multiculturalism and accessibility. HYY must find out the actual needs of students, for example with surveys, so that HYY can focus its advocacy work based on those needs. Mental health issues of students should be on the center of health discussion more strongly. Mental health should be seen as a part of general health and the stigma around mental illnesses should be systematically dismantled. Early intervention on mental illnesses prevents slowing down study progress, exclusion and more serious mental health issues. The mental health services offered for students must be made more accessible. For example Finnish Student Health Service (FSHS) should have a more flexible, low-threshold, way to get access to their mental health services beside their callback service. The supply of mental health services should equate the demand of them so that students in need of these services can get the help they need. Resolving the mental health issues of students should be a shared objective in our society. University must give more support for dealing with these issues. University should give better education on handling projects and stress right from the beginning of everyone’s studies. HYY must find out possible ways for the FSHS, university and publicly funded health care to cooperate on the mental health services they offer. Comprehensive wellbeing in the everyday life of students must be made possible for everyone. The university should offer more silent and peaceful working spaces for students. Ergonomics should be the focus on the design of new teaching and working spaces. The role of university sport should be established better and cooperation between university sport and FSHS should increase even more. The accessibility of FSHS and the quality of their health services must be secured in the future if students of universities of applied sciences will be transferred to use the services of FSHS. According to the Youth barometer 2017, the sense of being part of a community is strongly linked to happiness. HYY is the community which can enable this. HYY gives its members possibilities on creating and improving their social relations through different organisations. They also give a chance to participate on a meaningful free time activity. HYY should examine the sense of community among its members and advance operations to increase it even further. HYY must support organisations and tutors on creating and maintaining a communal environment and working culture. This should be done for example by supplying organisational premises, educating volunteers and giving direct financial funding for organisations. HYY must ensure that student representatives are a respected and equal members of decision-making bodies in the university. Students must have a real possibility to influence in these bodies. HYY will educate student representatives actively and searches new ways to develop these educations. HYY must ensure that student representatives has a chance to get credits for the valuable work they do in the university. HYY must actively develop and maintain the role of students in the university. Every student has the right to feel a part of the scientific community and ensuring this is HYY’s job. The ideals of the Big Wheel -educational reform must be made a reality. Interdisciplinary study opportunities increases and supports students sense of community in the university.